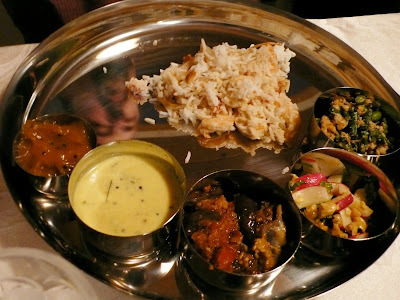 The Colors Of Indian Cooking: The Kerala Dinner. Part Deux, Shrimp Pullao. A Dish Fit For A Maharaja, Make it Easy. The Kerala Dinner. Part Deux, Shrimp Pullao. A Dish Fit For A Maharaja, Make it Easy. Last weekend I tossed a dinner party for some visiting friends from San Francisco and our local posse here in Sonoma. I always go nuts when I'm planning a menu. I hate the process of deciding. 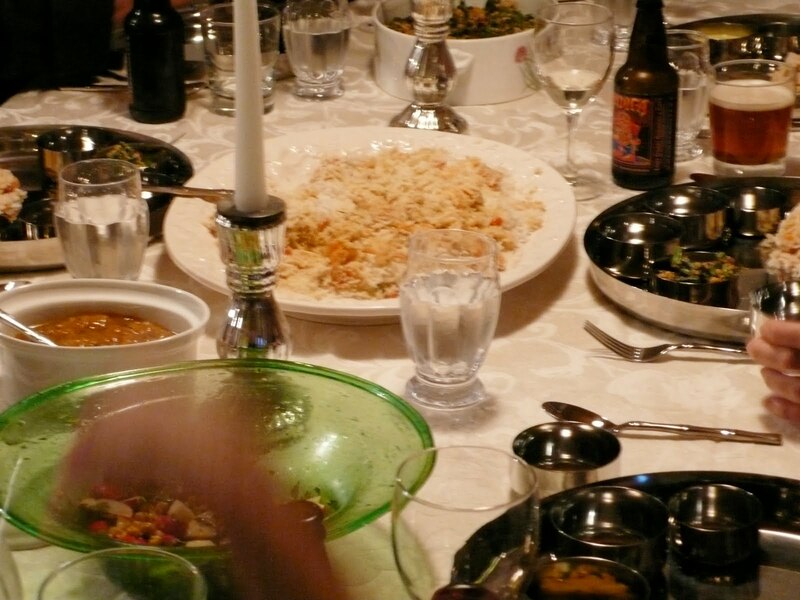 An Indian feast involves a lot of dishes and I'm always running through my mental rolodex trying to figure out what goes with what and what will make a harmonious whole. One has to take so much into account. Texture, heat, cool, wet, dry, color and cooking time. I spent 12 years in school dressed in a uniform, I'm not used to having to think about that stuff! Now I can't even make up my mind half the time about how to dress myself and I've got to match the colors of my food too??!! Give me a break. After thinking a while and getting all cranky, I decided on a meal featuring dishes from Kerala, one of my favorite Indian cuisines. Chip, one of our guests, is a vegetarian (he does eat fish) so I thought one of the great seafood dishes from this south coastal region would make a great centerpiece main dish. Now that was something I could build on. 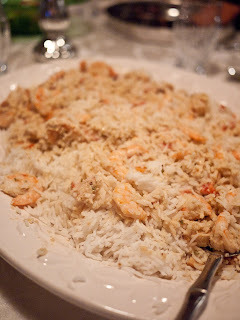 So, Shrimp Pullao became my little black dress of this dinner party. Something, I could build on, and accessorize. That is, if you call coconut an accessory (and I do). 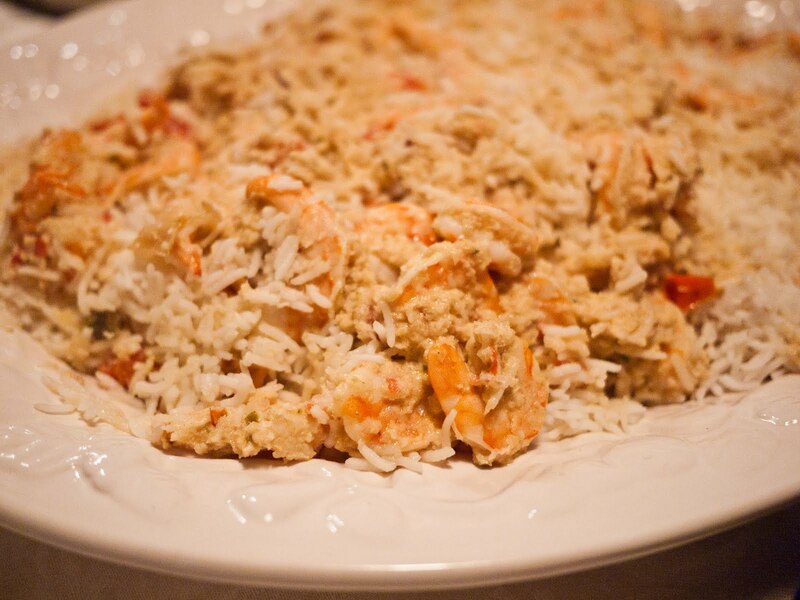 Shrimp Pullao is very similar to a Biryani in preparation. Spices are ground, a sauce is made, rice is parboiled and then it's all layered together in a large pot and popped in the oven. I find these sorts of dishes great for company dinners because they let me have more room on the top of the stove for other stuff, and I can also get the dishes used in making the main dish washed quick and out of the way. I am a little OCD when it comes to the kitchen. One of the key things in this dish is the rice, basmati rice to be exact. Good rice is the cornerstone of a good pullao. When I was at the market I saw all sorts of cool rice paraphernalia. "Awwwwww, can I have this Pleeeeeeease?!!! I really, really, really need a rice storage basket!!" Ok, so shopping trip aside. Here is how to make this amazing dish which actually is a pretty elementary and very, very tasty. I like to break this dish down into three parts, The Topping, The Sauce, and The Rice. 1/4 cup of raw cashew nuts, split in half. When the nuts are nicely browned take them out and put them on a paper towel to drain. Now, into the hot oil place 1 large onion cut in half and then into thin half moon slices. Stir them around until they are lightly browned. Then, set them on the other half of the paper towel to drain. Now set these aside because you won't need them until the dish is ready to go into the oven. Don't throw away the oil, because you're going to need it again. Soak 2 and 1/2 cups of basmati rice in enough water to cover it. Let it sit for about 30 minutes then drain it and set it aside. For this dish you're going to need about 1 lb of shrimp, peeled and deveined. The first time I made this dish I picked up a 1 lb bag of frozen, medium-size shrimp on sale at Whole Foods and they worked great. Those nifty bags of frozen shrimp have become a staple in my freezer. I call them the emergency dinner pack because one bag will feed a bunch of people with some other side dishes thrown in. If you are using frozen shrimp, defrost them and keep them in the fridge till you are ready for them. 8 shallots into a blender or a food processor and grind them up well into a paste. Put the paste into the hot oil. Keep this stuff moving, you don't want it to stick. The tomatoes will soften and darken. Stir fry it all, until the water is absorbed from the yogurt. Stir it all until the sauce thickens. Add in the shrimp, give them one stir and then take the pan off the stove. Pour the shrimp into a deep oven proof baking dish. I use a clay bram, but any good baking dish will do. Set it aside. the drained rice and give it all a stir. Let the rice cook for only 6 minutes!!! 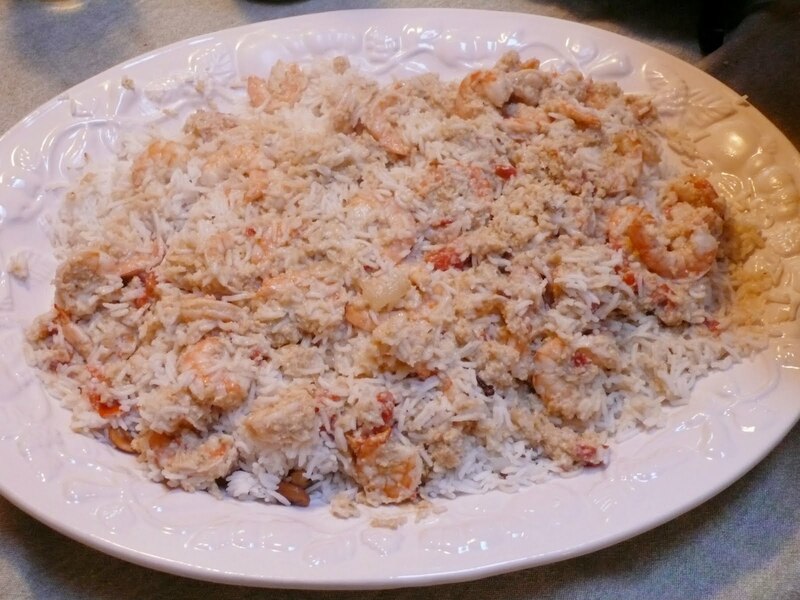 Drain the partially cooked rice in a colander and then dump it on top of the shrimp in the baking dish. Scatter the fried cashews and onions on top of the rice and then using a chopstick or spoon handle, poke a hole down the center of the rice all the way to the bottom of the pan. Cover the baking dish tightly with foil, crimp it around the edges and then put a lid on top of that. This dish is being cooked in the Dum Pukht style. That is, steamed in the oven in the pot. When the pot is tightly sealed, pop it into a pre-heated 325 degree oven and let it cook for 20 minutes. 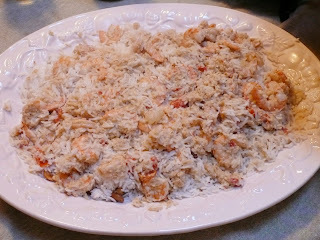 Take the lid off the pan, give the rice and shrimp a stir and spread it out on a platter and serve it up! This dish works great as the centerpiece of any sort of dinner party, Western style or Indian style. One simple side dish and you've got an impressive meal. One or two or three or four more dishes and an Indian feast is in the house! our winner is Llinda! However, I have no way of reaching Llinda as she didn't give me an email address . So Linda, if you're out there, shoot me an email. If I don't hear from Linda by Tuesday the 7th of September, I'll draw a new winner. Coming up next.... pickles are not just for cucumbers anymore! I would love to try this Kathy all the wonderful ingredients it so different for me, never had anything like this and shrimp is my favorite...any substitution for onions that I could put? That looks like alot, what would shredded zucchini taste like do you think? dang, that looks amazing. i'm glad you included all these step-by-step photos, which is time consuming and adds an element of nervousness when trying to prepare a dinner meal, so thank you! i'm so hungry now! this is a great dish and when you just go step by step it's really pretty straightforward. There is only one large onion in the recipe and that is what's sprinkled on top before baking. It's important because the other things are also cooked in the onion flavored oil which infuses the dish. There are a lot of shallots and you can sub them for garlic..but as for the onions I'd say I don't think the zucchini would do it. thanks, I never could have managed without my trusty "house photographer" Alan..who is very used to hearing "wait wait!" Or "Take the picture already it's burning!" What a beautiful feast you made there! Your guests are lucky. Um, I want that rice basket so badly I can just visualize it in my kitchen. Where was that and can I get it online? Did you get it? I know this is a very very tasty dish, so when are you invting me for dinner madame Kathy? OH wow! Love all the flavours and the textures. This is all so fantastic...love everything, and so warm and welcoming :) Beautiful job! thanks so much. I love throwing a dinner party! I got or rather Alan got my Bram for me for my birthday 2 years ago from bram cookware in Sonoma I've got a link to them on my website. I love cooking with it.